The great life force (i.e. contraction qi & expansion qi) is pumped into our physical body and conscious mind. Where does it come from? In the SATO Method, this great life force is called “Something Great”. The universe was created by Something Great. It represents the source of eternal life, birth parent of the conscious mind, and the absolute being from which tsustenance is indiscriminately pumped into the conscious mind going on a journey. Kazuo Murakami, Honorary Professor of the University of Tsukuba spread the designation of “Something Great” in the world. He is considered a world authority on the genetic research. At the time of universe creation, Something Great created the two major realms, i.e. visible and invisible ones. They can be considered the realm of consciousness and the one of unconsciousness. While the cycle of reincarnation was repeatedly experienced thereafter, another invisible realm was created in the invisible realm. It is so-called the shallow invisible realm. Some researchers classify it as personal invisible realm or collective unconsciousness realm. 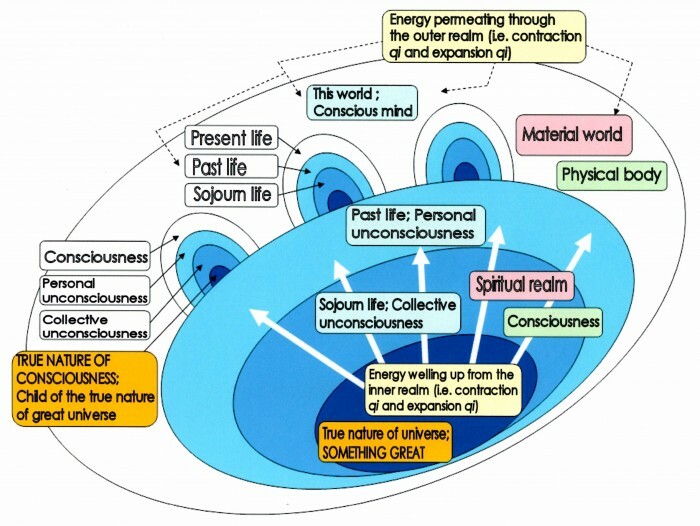 Barbara Brennnan, a world-famous scientist, considers these three major realms to be: (1) physical realm, (2) unworldly realm of bodily layer, and (3) unworldly realm of spiritual layer. In concrete terms, a tunnel-like image invariably comes in before out-of-body experience, allowing a sense of entering that tunnel. Mr. Sato calls it as the first tunnel. After passing through this first tunnel, those having out-of-body experiences become aware of themselves being in the universe or in the marvels of nature. In some cases, they also see the entire picture of the tunnel that is long and in the shape of thin cord. In some other cases, they stumble across the Milky Way Galaxy and go into the deep space, observing the complete picture of galactic group and/or large‐scale structure of the universe. Or, they sometimes make a time travel backward visiting some historical sites, or entering a physical body, having a glimpse of various organs and/or cells. Then, the second tunnel appears in the exising universe or in the great nature after passing through the first tunnel. This remarkably resembles the tunnel experienced during near-death. As compared to the first one, the second tunnel is considered to allow a higher spiritual sense. After going through the second tunnel, those having out-of-body experiences come into a more spiritual realm that reflects profound inner self. They find themselves uniting with the universe, feeling its vibration and/or the beat of their soul. Furthermore, they are awakened to the true nature of their consciousness and become aware of the reason why they have to incarnate and make spiritual learning. In Mr. Sato’s view, the evolution of human consciousness will be made through such experiences. ◆ SATO Method enables Self-enlightenment in addition to Healing. Bodily ills, diseases of the mind, inability to exhibit competence, incapability to provide an idea, etc. are all due to lack of power. When the body, eyes, mind, etc. are overtaxed, the sympathetic nerve is excessively strained with energy exhausted. Then, deficiency in power is caused. It also menas that the beta wave has been overworked. Those who always have good physical strength and mental toughness do themselves justice while taking in power with their sympathetic nerve being in a predominant position. Generally speaking, we can sleep deeply, work relaxed, and eat cheerfully if our sympathetic nerve is predominant. However, many people have a hard time doing it. SATO Method enables such people to energize themselves, making it possible to fully tap their potential. In concrete terms, the alpha wave and the delta wave become predominant in case of the warm mode and the cool mode, respectively. Furthermore, if we are in the deep meditative state or if the “centroid of qi” comes down to somewhere below the sole, such three kinds of wave as alpha, theta, and delta simultaneously appear at the frontal lobe. At that time, enormous power wells up from inside the body, making it possible to do good work with enough strength in reserve. In this case, out-of-body experiences are referred to as the ultimate level of performance. If such body sensation can be maintained with self-training, a new potential is expected to develop in various kinds of sports that have so far been based only on the power training.